Bethanie Hines Grand Slam champ Imani Diltz likes how slam poetry provides young people safe spaces to speak their truths. Applause rang throughout a sold-out Nourse Auditorium in San Francisco last month when seventeen-year-old Imani Diltz took the stage at the Youth Speaks Teen Poetry Grand Slam finals. As she approached the mic, silence set in. She paused for a moment as she gained the attention of the room. "It's 1963 and you still spin on hand-polished shoes, black bright and clean just like your mother reared your two brothers and your younger sister. All southern sirs, ma'ams and starched on Sundays," Diltz began. The audience snapped along as she entered the second stanza, "It's 1992 and LA is not on fire for you tonight. There are no riots in your name, and you barely make the evening news. The people are too tired of the incessant blood inseparable from brown and blue, so the slam of your body against the concrete doesn't make their feet falter." Diltz is part of a team of five youth poets from the East Bay who will represent the Bay Area at the eighteenth annual Brave New Voices International Youth Poetry Slam in Atlanta this summer. Brave New Voices was created by Youth Speaks Inc. in 1998 and has been featured on national media outlets including HBO, which aired a series on it. During Brave New Voices, hundreds of young poets will come from across the globe to participate in as many as thirty workshops and fifty events over a five-day span. 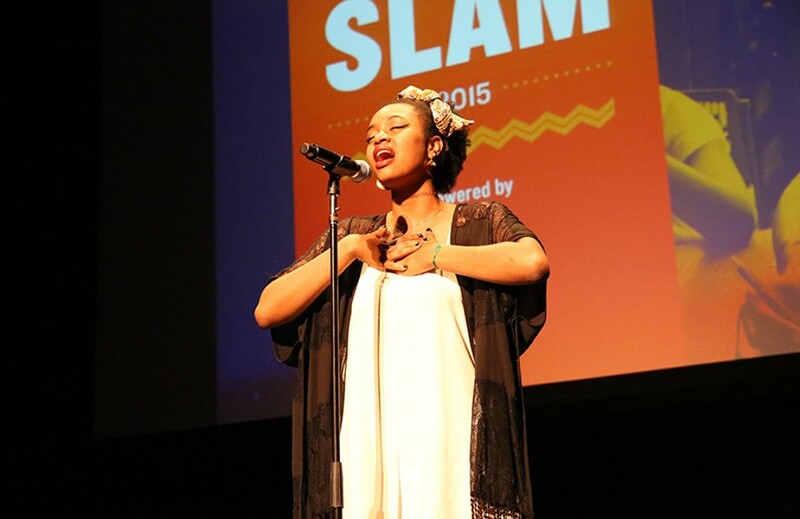 In addition to Oakland-based Diltz, other Bay Area representatives include Aleah Bradshaw (Aurora), Sarah O'Neal (Oakland), Jamaya Walker (Richmond), and Brenda Quintanilla (Richmond) — all of whom were winners of the Youth Speaks Poetry Slam. Winner Imani Diltz was also crowned this year's Grand Slam Champion. Youth Speaks Poetry Grand Slam from Kris Stewart on Vimeo. Diltz has been writing poetry since she was in the second grade. Currently a member of SPOKES, Youth Speaks' youth advisory board, Diltz has been working with the nonprofit for the past two years. "Youth Speaks is everywhere in my life," said Diltz. "I like the idea that it's a space created specifically for young people to speak their own truth. They're stories that people are unable to tell, because they don't have safe spaces to tell those stories." The notion of a safe space is evident in seventeen-year-old slam winner Jamaya Walker's piece, "Safe in the Rain," a poem about how something as simple as weather can bring her father home from the streets. "The weather is the only thing that can drive them home when not even the love of a woman can," said Walker during her performance at the semi-finals that was held at the San Francisco Main Library on March 7. "My mother believed my father's future rested on the shoulders of the weather." Diltz said that many of the poems are personal because Youth Speaks gives teens an inviting atmosphere to share their individual stories. Lately, Diltz has been writing about police brutality and violence. "How many poems can be written on something that's happening that constantly?" said Diltz. James Kass, executive director of Youth Speaks, founded the nonprofit in 1996, and since its creation, it has evolved from an organization to a movement. In April 1997, Youth Speaks hosted its first poetry slam. It was also the first poetry slam for teenagers in the United States. Sixty people attended that first slam. Today, thousands of people come out to listen to teenagers speak their truths, and a distinctive community is forming around it. "The work is powerful. It's urgent. The [teens] write about what is really important to them in the moment. It's not poetry for poetry's sake," said Kass. "It's poetry for personal transformation for cultural and community transformation. I think that's the big thing. It's become a space of transformation." Kass said that prior to Youth Speaks, very few places or clubs existed for spoken word in high schools. Teachers didn't want to teach poetry, he said, and it was thought of as "that thing over there," something foreign and misunderstood. "Young people have really redefined what poetry can even mean," said Kass. Kass himself began writing as a teenager in New York, which is what he said inspired him to create Youth Speaks. He knew what writing had done for him and wanted to create a space at which he could provide the same opportunities to other young people. Although it's a nationwide organization, Youth Speaks' home is in the Bay Area. Its central locations are in San Francisco, Oakland, and Berkeley, but it welcomes youth from all over the region. "Here, you come in and everybody is the same," said Kass. "Everybody has the same opportunity. The most important thing is that you bring your mind, your tongue, your hands, and you're ready to write, think, talk, and share." Sarah O'Neal, nineteen, started writing poetry in eighth grade in response to a protest against the Israeli bombardment of the Gaza Strip. O'Neal found out about Youth Speaks last year, and commuted from Sunnyvale to San Francisco in order to participate in its programs, because no youth organizations were available in her hometown. As a biracial Muslim woman, O'Neal gravitates toward writing about nuances of identity, religion, and spirituality. This is evident in one of the pieces she performed at the grand slam finale entitled "Zam Zam," named after the Well of Zamzam in Saudi Arabia. This piece explored O'Neal's experience with Islamophobia, the recent shooting of three Muslim students in Chapel Hill, North Carolina, and O'Neal's relationship with her mother. In January, O'Neal performed her piece "An Overreaction" in a video published on YouTube for AJ+, a digital news channel created by the Al Jazeera Media Network. "You can say all lives matter, but all lives are not killed every 28 hours. All lives will matter when Black lives matter," O'Neal said in the video. O'Neal said she thinks that youth poetry culture has grown immensely in the few years she has been involved with Youth Speaks. 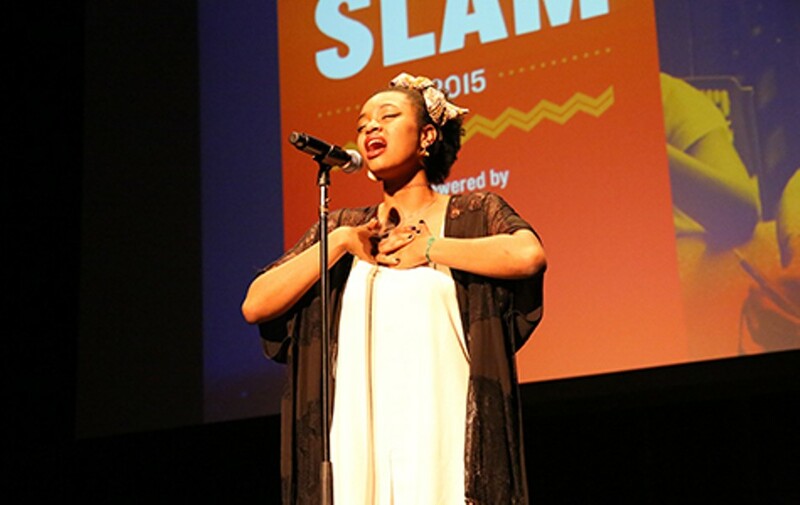 O'Neal attributes slam poetry's popularity in part to its ability to break down barriers. "Everybody's story is celebrated," said O'Neal.